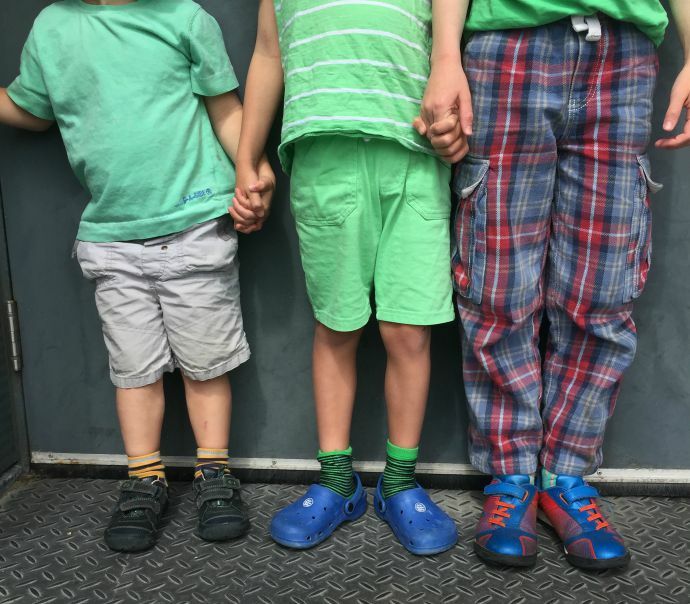 Younger siblings get a raw deal: less attention, second-hand clothes, toys with bits missing…But in some respects they’re way ahead of the game – all thanks to their older siblings. The signs are easy to spot. 1. Twinkle Twinkle Little Fart: Mummy might forget to teach you all the nursery rhymes, but that’s OK, cos your big brother taught you all the rude versions. Cue “Happy Birthday to you, I saw a big poo” at granny’s 80th. 2. You Are Nails. The daily rough and tumble of family life makes you immune to minor injuries. You only ask for a plaster cos you know it gets you a sweetie. 3. Baby Swings Are For Wimps. You will only go on the big swings. You will try and stand up on them. Before falling off and running to dangle dangerously at the top of the fireman’s pole, causing the whole park to tut at your mother. 4. You Eat Chocolate. Yeah, that’s right. It’s not because your mum is a bad person. It’s because you scream the house down if you don’t get the same Freddo fix as your brothers. 5. You Can Read. OK, you can’t actually properly, full-on read. But you know your letters and your numbers way before the others did. How else do you ensure you get your fair share of Tangfastics? 6. Spoon As Large As Your Face: You refuse to use childish props such as mini cutlery and lidded cups. You can’t fit your mash in your mouth or go a meal without smashing a glass, but at least you’re like your siblings. 7. You Are Good At Sharing. Well, you’re OK. To be honest, if your siblings aren’t around, it’s dog eat dog – and you have ninja training. 8. You Eat Quickly. You have to, or your vulture older brothers will nick your chips. 9. You’ve Seen Star Wars. All of them. You’re three. 10. You Are Happy. Of course, children without siblings are happy too. But despite having less attention from your parents, you wouldn’t change your big brothers – who love you fiercely if not always gently – for anything in the world. Except maybe a new scooter. Their old one is knackered. Next articleAre You At Risk Of Squandering Your Me-Time? So very true! Youngest children might be the ‘baby’ of the family, but they’re anything but! They have knowledge way beyond their years – mainly of things we’d rather they didn’t have knowledge of. So, so true, Jess. The youngest always seem to grow up so much faster. Kara is convinced that she’s seven, and in between all the pretty dresses and girly stuff I know she can more than hold her own with her two brothers – and she knows exactly how to (a) get what she wants and (b) get them rather than herself into trouble. And they’ll still stick look after her no matter what. Jude recently posted…We’ve given up TV so you don’t have to; here’s what we’ve learnt. I love this Jess. So true. Especially the loving fiercely but not gently! Thanks Claire! Definitely true of my youngest’s older siblings! So true! I’m often embarrassed at the things my 3-year old daughter comes out with (that she gets from her 6-year old brother) but what can you do? !